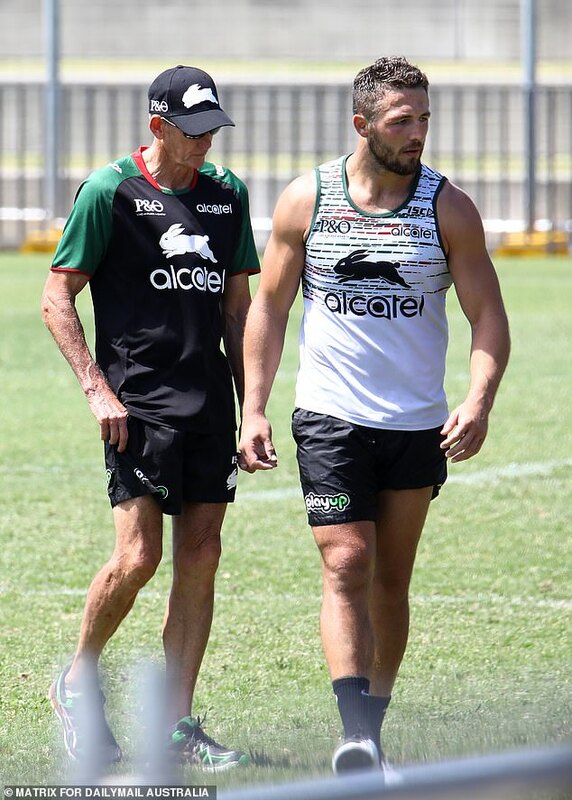 Sam Burgess has returned to the footy field for the first time since his marriage breakdown, shouting at his teammates and having a quiet word with coach Wayne Bennett. 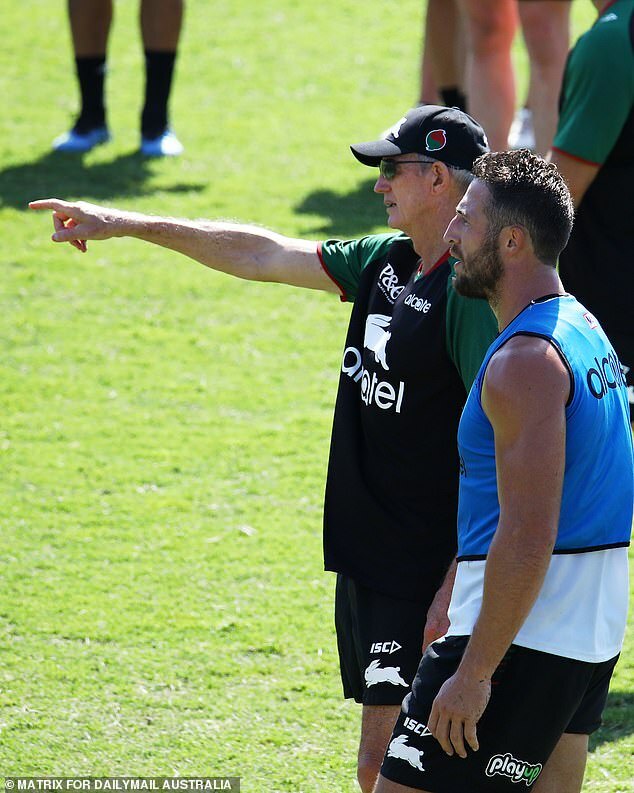 The troubled South Sydney Rabbitohs forward returned to Redfern Oval on Tuesday for the team’s inaugural training session for 2019 after spending the Christmas break splitting up with wife Phoebe and dodging paparazzi. Burgess looked downcast as he charged about the field and huddled with Bennett – himself no stranger to a relationship falling apart in the full glare of the media spotlight. Bennett and his wife Trish broke off their relationship of 42 years in 2016. He is now engaged to medical secretary Dale Cage. Burgess, 30, today appeared focused as he trotted around the oval in the sunshine, completely ignoring media. Since packing his bags and leaving the couple’s home, Burgess is reported to have been supported by Souths co-owner Russell Crowe at his north coast property. Burgess’s reappearance comes after it was revealed his mother had made her feelings public about his marriage breakdown. 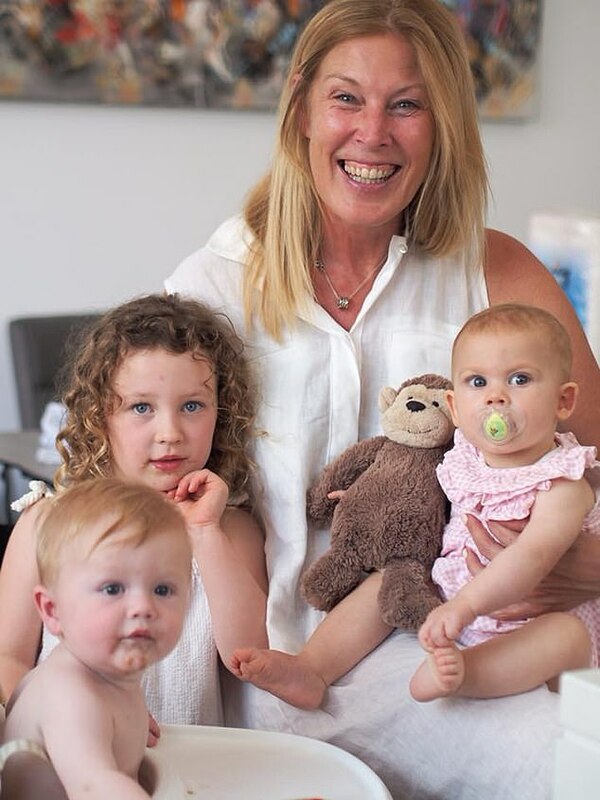 Julie Burgess took a photo from Sam’s wedding off Facebook on Friday and replaced it instead with one of herself and three of her grandchildren. 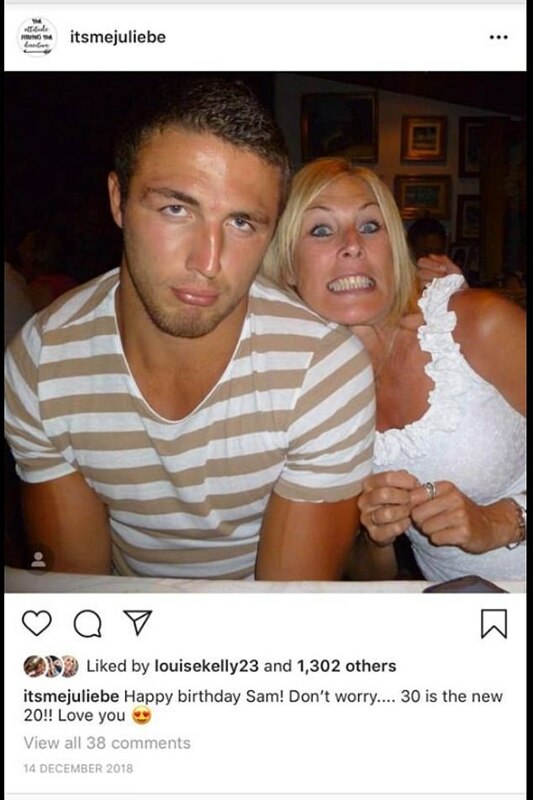 The mother of the four English rugby league stars made the move just a day after her highest profile son was revealed to have walked out on his wife prior to Christmas. Sam, 30, was pictured walking out of the the couple’s family home in Sydney’s south east Sydney with three fully packed overnight bags in the hand last week. Phoebe is believed to be holed-up in the $3.8million marital home accompanied by her mother Sarah Hooke, pregnant sister Jemima Fairbanks and her husband Gene. 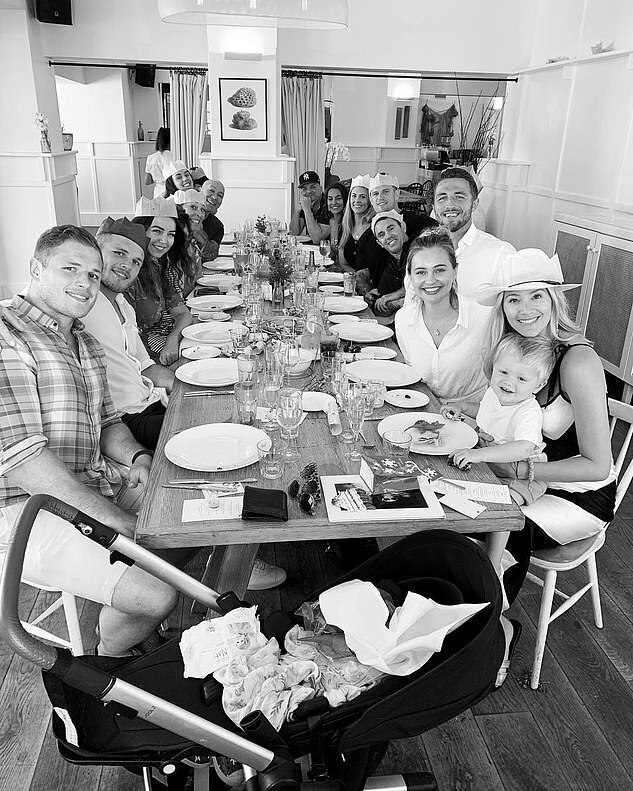 Just days earlier Sam had spent Christmas Day with his mum, brothers Luke, George and Tom, their partners and NSW Origin Coach Brad Fittler, at Watsons Bay Boutique Hotel. In another social media post from the weeks leading up to the marriage breakdown Mrs Burgess wished her second oldest son a happy birthday. ‘Happy Birthday Sam! Don’t worry… 30 is the new 20!! Love you,’ she captioned the photo. Unusually, Phoebe did not post a photo celebrating her husband’s milestone. The demise of the South Sydney star and his journalist wife’s relationship was made public weeks the birth of their second child, William Mark Burgess, on December 9. Announcing the news on Instagram two days later, Phoebe wrote: ‘Welcome to our world little big man, our hearts are so full’. She also used the hashtag ‘FamilyofFour’. The Burgesses also have a daughter, Poppy Alice, who is almost two. In September Sam was cleared of any wrongdoing after a 23-year-old woman claimed two unnamed Souths players had sent her lewd images of themselves via Facebook in May. When news of the sexting scandal broke Phoebe, who was 28 weeks’ pregnant, cancelled a scheduled appearance at Sydney’s Royal Randwick racecourse. The Englishman met journalist Phoebe Hooke at a concert by the late Swedish musician Avicii in early 2014. They made their public debut as a couple at the Dally M awards in September that year. Sam reportedly proposed during a holiday in Europe and they married at Phoebe’s parents’ home in the New South Wales southern highlands in December 2015. Russell Crowe was a guest at the nuptials. Sam and Phoebe bought a four-bedroom home at Maroubra in Sydney’s south-east for $3.8million in early 2016 and had been living there together until recently. Burgess, a dual-code international who earns more than $1million a year, signed a contract extension with Souths in September which will see him stay at the club until the end of the 2023 season.